Select the appropriate category from the menu. 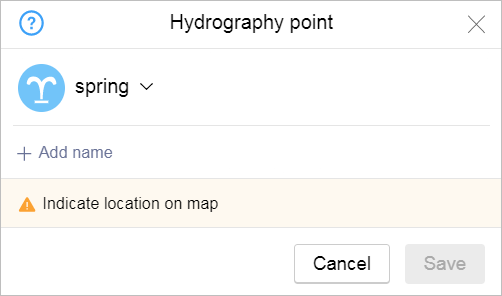 Then the attribute panel for the map item opens: Hydrographic items are represented using placemarks (for “Hydrography points”), lines (for “Areas of riverbed”), and polygons (for “Reservoirs”). Rules for adding attributes to these type of items are found below. Select an item type from the list. For example, Atlantic Ocean, White Sea, Bering Strait, Lake Ladoga, etc. The “Swamp” and “Outdoor pool” types can be assigned to items of those types even if their names don't include those distinctions. Hydrographic polygonal items with no dedicated type (polygonal rivers, channels, fountains, sewage treatment plant reservoirs, etc.) are attributed the “lake or water reservoir” type. Hydrographic items are named in accordance with the general rules. See 3.1.3. Map item naming rules. When you duplicate a riverbed or channel using a polygon, assign Reservoir attributes to that item (see point 3.10.2.1.1). Don't name these polygonal items: the “Name” field should be left blank. The “part of” attribute indicates that a section of riverbed belongs to a certain river. Indicate the name of the river that contains the section you are assigning attributes to. 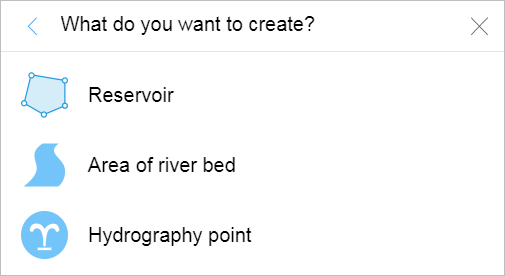 If the river is already on the map, then select its name from the list of suggestions. 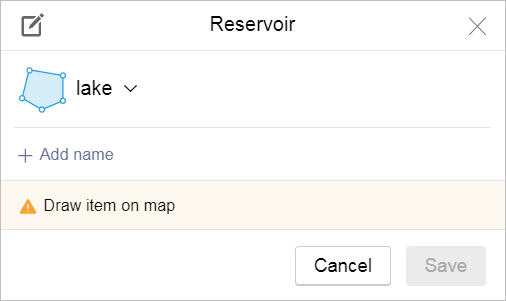 If the river is not on the map, you must fill in this field manually: enter a name for the new river and it will be created. After you save the item, the name of the river displays in the panel as a link that opens the river editing panel. Editing techniques for these composite linear items are described in section 2.6.2. Composite linear items. For more information about the names of rivers, please see Section 3.10.3.2. River name. When you enter an item type, select the value from the list.